Like most performance enhancement coaches, I pursued a career in the industry because I love to train, be athletic and look good without clothes on…and I knew this from a very early age. When I was in 7th grade my father introduced me to my first “true” training session. Back then all we knew was that lifting weights made you stronger and allowed you to build muscle. So I did what you would typically find with any teenage male doing when it came to training: I was benching, doing 30 variations of dumbbell curls, hitting some push ups and trying to chisel up my six pack. My father gave me a little more direction as he was following a classic body building routine, so eventually I threw in some back, shoulders and tricep work. No leg work though…I played basketball so I got plenty of leg work, and no girls were interested in how my legs looked, it was all about the chest and bis. And while I now know that a body building split, especially one that dismisses legs , is not optimal for enhancing performance, gaining muscle and losing fat, I still noticed progress in all of those qualities. So as any truly competitive individual would do, I dedicated myself to training (lifting at that time) in order to give myself an advantage on the court (I was a basketball player) as well as boost my ego…I was a teenage boy! Throughout my high school and college career I spent a lot of time in the weight room. I continued to get stronger, more muscular and stay very lean. I was consistently one of the fastest, most explosive athletes when we played ball (either competitively or pick up). I looked good, felt good and I loved it! I was beating the hell out of myself and not giving myself adequate recovery time, because well, more was always better…right?! And to make things worse, I was not moving very well and I was a great compensator. I got the job done, but underneath it all, I was moving poorly, which, when paired with lots of volume and little recovery is perfect for an overuse injury. My lower back was the first region to give me problems. Then my hips and finally my shoulders. I ended up needing surgery to repair the damage in my hips, and I was told I needed surgery on my shoulder. Luckily I have been able to stay off the table for the shoulders as with some help I finally figured out how to move. But, it was not before I lost everything that defined me. My athleticism, my body, my identity as whole. In essence, I had died. Not literally, but I definitely was not me anymore. Before you feel too bad for me, or get totally grossed out by that picture (I actually just threw up a little), I will tell you that I am nearly back to my previous self. It has been a long LONG road back, and there have been a few big changes to the way I approach my training, nutrition and overall lifestyle. And it is those lessons that I want to share with you to further help you with your journey through health, performance and an athletic life. **I had to give you a few more of the good pictures to try and erase the bad pictures from your memory! The following tips have been compiled as a result of mistakes I have made, and after you read through them my hope is that you will not fall victim to the same mistakes. As with most athletes, I am a great movement compensator. I will undoubtedly get the job done (squat, deadlift, lunge, jump, cut, etc.) but how I get it done is key for me to stay healthy. Before I started to experience symptoms of my injuries, I would squat and deadlift with a hyperextended lower back, my knees would collapse in during lunges and my shoulder blades would stay pinned down and back when my arms would go overhead (among other movement flaws). I would walk around and live with an anteriorly tilted pelvis and my shoulder girdle was nearly in my back pocket all day (not a good thing if you do anything with your upper body, especially under load). These improper positions and faulty movements led to the degradation of the structure of my joints and eventually chronic pain. So before you load the weight, volume and speed of movements, you must make sure the movement is EXECUTED properly. When a joint that is out of neutral and placed under stress, it is inevitable that it is going to degrade and result in an overuse injury! Some of us do not move well at all, still place stress on our bodies (training, sport, occupation), but will never experience chronic pain or injury. Not only are these people extremely lucky, but it is in large part the fact that once they are done stressing their bodies, they rest for the remainder of the day. They do not train, then go for a run, then walk the dog, then hit a second training session. They likely train hard for an hour and the rest of the day is very low key. They then get adequate sleep and recovery. I’m not saying that we should be totally sedentary and that will fix our overuse problems, but what I am saying is that loading too much volume on the body, and then compounding that volume with little rest and recovery is the perfect recipe for an overuse injury. I used to train hard, play basketball for at least an hour, bike to and from my apartment to campus and then sleep less than 7 hours at least 6 out of 7 days per week. Anyone who places this much demand on their body will eventually break. Controlling volume and recovery is key to longterm progress and health…more is not always better! The next two points piggy back on the last. This point has to do with volume regulation. Before my injuries I definitely fell victim to the thought that more was better, or, quantity over quality. I was a student in the field of exercise science, and all of the text were explaining to me that there was a dose response to exercise that if I surpassed I would not experience better results (in fact I was doing more harm than anything). Still I felt that in order to get bigger, stronger and more athletic I had to complete a ton of work. Nearly every training session would last 1.5 to 2 hours and I would complete a minimum of 30 sets (sometimes as high as 40 sets)…and that was before conditioning / basketball. And don’t get me wrong, you absolutely have to continue to progressively overload the body in order for it to adapt, but there are better ways to do so than just simply adding more and more work. Now, I rarely complete more than 25 sets total with 3-6 of those sets being lower level core/activation/mobility work. I spend no more than 75 minutes on a single session including warm up and post training recovery. And the crazy thing is, I have achieved roughly 90% of the results (strength, size and body composition) as I did when I was spending upwards of 3.5-4 hours in the gym a day. I put a priority on my main exercises, and follow them up with a few assistance exercises. This way I get rid of the extra volume that isn’t helping me, and would likely be setting me up for another overuse injury. Instead of focusing on how much work you complete, make sure to focus on the quality of work you are completing. Again piggy backing on the previous two points, high low training is a great way to manage volume and recovery. I believe I first heard the term high low training from Joel Jamieson of 8weeksout.com. 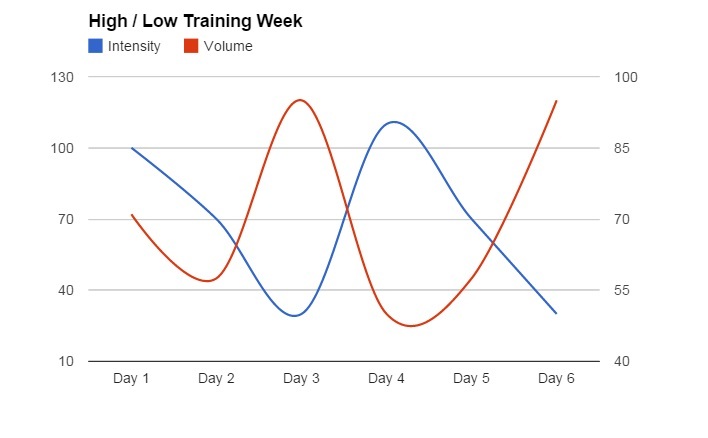 It is exactly as it sounds…a great way to approach training is to break up high intensity days with lower intensity days in order to promote greater recovery between the more demanding sessions. Before my injuries, I rarely completed low days. Every session was a demanding session, whether that was a resistance training session or a conditioning session. This not only led to a decreased performance with my sessions, but it was catalyst to my overuse injuries. Now I make sure that my higher intensity sessions are bookended with lower intensity sessions. An example would be a lower body push and upper body pull day, followed by a low volume sprint day, then a lower body pull and upper body push day, followed by a cardiac output day (longer slower conditioning). After that I may take a complete active rest day before I repeat the cycle. This allows my body to adapt and grow stronger, leaner and more athletic. Not only that, but it gives my “mental gas tank” a chance to refill which allows me to put out a greater effort with every high intensity session. Try following a layout like this for a little while and it is likely that you will notice that you are progressing faster, as well as happier and not dreading any one session. When I used to learn something that was backed by quality evidence, I’d take it and run with it…sometimes a little too far. So, when I found out that processed food was not optimal for health and performance, in my mind I could not justify consuming any…ever! No more bagels, cereal, ice cream or pizza. No more soda, fruit “juice” or creamer in my coffee. I would skip going out with my friends and family, and even my girlfriend at the time, which never went over well. Although I knew better, in my mind I thought that if I consumed any of the foods on the “you shouldn’t eat or drink” list, I would immediately lose my six pack, all of my muscle and my reputation as a healthy and athletic individual. But I’ve learned better…thank God (or whoever you believe in). Now I consume foods that I wouldn’t even fathom touching, EVERY DAY! In fact, as I am writing this, I am finishing up a piece of sweet cornbread from a local bakery…and it is delicious. But the key is, as we have all heard, moderation. If I were to eat the whole loaf of corn bread, I would have a problem. It would be too much sugar and overall calories to sustain my physique and health. So instead, I’m eating a piece big enough for two solid bites. And tomorrow I’m having a cheeseburger, and a bun…I know, OMG!!! But with my cheeseburger I will have a side salad, not french fries or onion rings. See, moderation. With that said, I still do stay away from certain things as much as I possibly can. Mainly hydrogenated fats and unnecessary added sugar. The point is, you can have a little something that “you shouldn’t” every day and still be perfectly healthy as well as achieve and maintain the physique you want. You just can’t let a little something turn into a lot of something every time you consume food (or drink). Enjoying a little something will also help you stay consistent with your nutrition as we all know, depriving ourselves of anything for too long inevitably results in over indulgence and possibly the “what the hell, I’m just gonna keep going” attitude. One last tip, plan on your little something(s), that way you can portion it appropriately and you won’t be so tempted when your co-worker brings in a dozen donuts on Monday. After more than 2000 words (thanks for staying with me) I hope that the points above can help you avoid the long, arduous journey I have taken from healthy and strong, to weak and broken, and back again. You need to move well (and learn how to do so! ), manage the stress you put on your body, recover well, give yourself a chance to adapt and grow, and enjoy the little things along the way. I also hope that you can see that achieving the body, health and performance you want does not have to come at such a severe sacrifice to your life, happiness and overall well being. It will take work, and there will be some sacrifice, but as like anything else in life, when you are too radical you are likely to experience negative results, and affect those around you as well. Let me know what you think about this article in the comments below, and share it with those you care about…ya Facebook, Twitter, whatever your social media go to is! And for specific help, you can always reach out to me at kyle@theathleticway.com! Its All About the Days AFTER the Holidays! Shoulder Pain When Pressing/Reaching Overhead…Check This Out!